The 2015 Meistriliiga (known as A. Le Coq Premium Liiga for sponsorship reasons) was the 25th season of the Meistriliiga, the first level in the Estonian football system. The season started on 6 March 2015 and the final matchday took place on 7 November. Levadia, the defending champions, finished runner-up behind Flora, who won their tenth title. A total of ten teams will contest the league, including 8 sides from the 2014 season and two promoted teams from the 2014 Esiliiga. Tallinna Kalev were relegated from the Meistriliiga after three seasons and were replaced by Pärnu Linnameeskond, the best of independent teams in 2014 Esiliiga, Pärnu made their comeback to top flight after 6 seasons on lower levels. Lokomotiv were relegated after a single season, they were defeated in the relegation play-offs by Tulevik returning to Meistriliiga after four-year absence. Transfers made during the 2014–15 winter transfer window. Transfers made during the 2015 summer transfer window. Rules for classification: 1) Points; 2) Play-off (only if deciding champion); 3) Less matches awarded against; 4) Matches won; 5) Head-to-head points; 6) Head-to-head goal difference; 7) Goal difference; 8) Goals scored; 9) Away goals scored; 10) Fairplay ranking. ^ Flora Tallinn qualified for the Europa League first qualifying round by winning the 2015–16 Estonian Cup. However, since they already qualified for European competition based on their league position, the spot awarded to the cup winners was passed down the league. At season's end Tammeka, the ninth place club, participated in a two-legged play-off with Tallinna Kalev, the runners-up (of the independent teams) of the 2015 Esiliiga, for the spot in next year's competition. Tammeka won 4–2 on aggregate and retained their Meistriliiga spot for the 2016 season. Each team plays every opponent four times, twice at home and twice away, for a total of 36 games. 4 Player scored 4 goals. Ingemar Teever was named Player of the Season. Raido Roman's goal against Tammeka was chosen Goal of the Season. ^ "Kodune tippjalgpall saab peatoetaja" [Domestic top football will get the main sponsor] (in Estonian). Estonian Football Association. 26 February 2013. Retrieved 11 December 2013. ^ "Eesti 2014.a meistrivõistluste Meistri- ja Esiliiga juhend" (PDF). jalgpall.ee (in Estonian). Estonian Football Association. 15 November 2013. p. 16. Retrieved 11 December 2013. ^ "Flora take tenth Estonian title". uefa.com. UEFA. Retrieved 7 November 2015. ^ "A. Le Coq Arena" (in Estonian). FC Flora. Retrieved 11 December 2013. ^ "Kadrioru Staadion" (in Estonian). Eesti Spordiregister. 16 September 2015. Retrieved 25 November 2014. 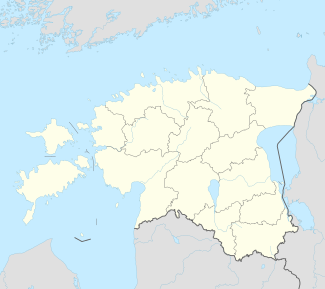 ^ "Narva Paemurru Spordikooli Kreenholmi staadion" (in Estonian). Eesti Spordiregister. 6 October 2014. Retrieved 24 September 2014. ^ "Hiiu Staadion" (in Estonian). Eesti Spordiregister. 29 December 2014. Retrieved 12 February 2015. ^ "Paide linna staadion" (in Estonian). Eesti Spordiregister. 24 September 2014. Retrieved 25 November 2014. ^ "Pärnu Raeküla staadion" (in Estonian). Eesti Spordiregister. 25 September 2014. Retrieved 12 February 2015. ^ "Spordikompleks "Kalev" staadion" (in Estonian). Eesti Spordiregister. 13 October 2014. Retrieved 24 September 2014. ^ "Tamme staadion" (in Estonian). Eesti Spordiregister. 8 October 2014. Retrieved 24 September 2014. ^ "Viljandi linnastaadion" (in Estonian). Eesti Spordiregister. 22 October 2014. Retrieved 25 November 2014. ^ "Flora sai koondisega sama sponsori". Soccernet.ee. 25 September 2014. Retrieved 3 October 2014. ^ "Uus mänguvorm". JK Narva Trans. 5 March 2014. Retrieved 7 March 2014. ^ "Nõmme Kalju sõlmis Eesti klubijalgpalli ühe suurima lepingu". jkkalju.ee. 7 February 2014. Retrieved 14 February 2014. ^ a b c "Pärnu läheb uue peatreeneri ja peasponsoriga tähtede poole" (in Estonian). Soccernet.ee. 22 December 2014. Retrieved 22 December 2014. ^ "Bestra sponsors top-team". Bestra. Retrieved 7 March 2015. ^ "Ametlik: Prinsi aeg Kaljus sai läbi" (in Estonian). Soccernet.ee. 2 December 2014. Retrieved 2 December 2014. ^ "Ametlik: Kalju peatreeneriks asub Terehhov" (in Estonian). Soccernet.ee. 10 December 2014. Retrieved 10 December 2014. ^ a b ""Las ta puhkab natuke" – Trans eemaldas Jagudini" (in Estonian). Soccernet.ee. 20 May 2015. Retrieved 22 May 2015. ^ a b "Sillamäe vallandas Frantsevi" (in Estonian). Soccernet.ee. 29 May 2015. Retrieved 29 May 2015. ^ a b "Trans vahetas taas peatreenerit" (in Estonian). Soccernet.ee. 6 July 2015. Retrieved 6 July 2015. ^ a b "Sergei Terehhov astus peatreeneri kohalt tagasi" (in Estonian). Nõmme Kalju FC. 14 September 2015. Retrieved 14 September 2015. ^ "Eesti 2015. a meistrivõistluste Premium ja Esiliiga juhend" (PDF) (in Estonian). Estonian Football Association. 25 November 2014. p. 12. Retrieved 12 July 2015. ^ "Meistriliiga 2015 - Season rules". Scoresway. Retrieved 12 July 2015. ^ "Eesti 2014.a meistrivõistluste Meistri- ja Esiliiga juhend" (PDF). jalgpall.ee (in Estonian). Estonian Football Association. 15 November 2013. p. 11. Retrieved 11 December 2013. ^ "ML VÄRAVALÖÖJATE EDETABEL (2015)" (in Estonian). Estonian Football Association. ^ "Meistriliiga 2015 statistika" (in Estonian). Soccernet.ee. ^ "ML SUURIMAD SÖÖTJAD (2015)" (in Estonian). Estonian Football Association. Archived from the original on 2015-05-05. ^ "Premium liiga kuu parimad on Hurt ja Kallaste" (in Estonian). Estonian Football Association. 2 April 2015. ^ "Premium liiga parimateks valiti Terehhov ja Zahovaiko" (in Estonian). Estonian Football Association. 6 May 2015. ^ "Premium liiga maikuu parimateks valiti Lillevere ja Teever" (in Estonian). Estonian Football Association. 5 June 2015. ^ "Juuni parimateks valiti Marko Kristal ja Jevgeni Harin" (in Estonian). Estonian Football Association. 1 July 2015. ^ "Premium liiga kuu parimateks valiti Terehhov ja Luts" (in Estonian). Estonian Football Association. 6 August 2015. ^ "Premium liiga kuu parima tiitli said Kristal ja Teever" (in Estonian). Estonian Football Association. 9 September 2015. ^ "Premium liiga kuu parimad tulevad Transist ja Levadiast" (in Estonian). Estonian Football Association. 2 October 2015. ^ "Hurt ja Sappinen teenisid kuu parima autasu" (in Estonian). Estonian Football Association. 5 November 2015. ^ "Premium liiga parimaks mängijaks valiti Ingemar Teever" (in Estonian). Estonian Football Association. 22 November 2015. ^ "Premium liiga hooaja ilusaimaks väravaks valiti Raido Romani kauglöök" (in Estonian). Estonian Football Association. 23 November 2015. This page was last edited on 20 October 2018, at 11:50 (UTC).